The need to export Lotus Notes address book to Outlook often arises when the user has to access their mailbox data through MS Outlook. Exporting the lotus notes to Outlook can get tricky since technological knowledge is a prerequisite to the process. People however usually go on to import address book to Outlook 2010 for many reasons. The top-most reasons are that Lotus Notes is difficult to use for new users and it can get costly. Meanwhile, Outlook is user-friendly and has more features. 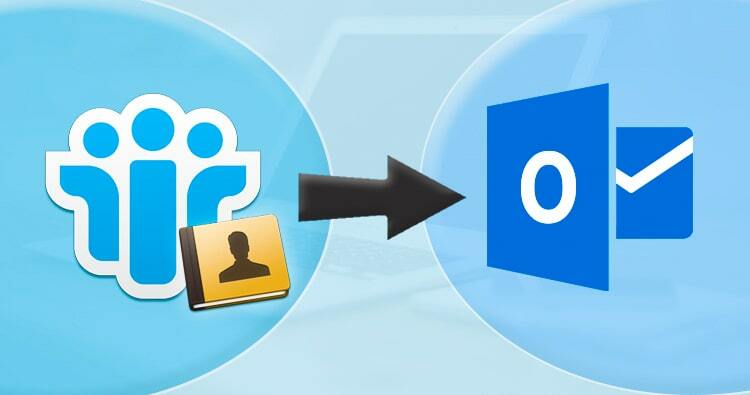 We are going to explain the intricacies involved in lotus notes contacts to Outlook migration. Begin by launching Lotus Notes and clicking on contacts. Then go to the menu bar and click on More> Export contacts. An Export Contacts dialog box will appear. To carry address book to contacts outlook export, select the All Contacts in this view option. You have to select All fields to export all the information of the contacts. Then in the Save to field, browse to the directory to which you would like to save the contacts. A File Name option will appear where you can name the file. Then in the Save as type field, select CSV option. Launch the Microsoft Outlook and click on Open> Import. You will get the options of import and export. Then the field of Choose an action to perform will appear. Here you have to select the Import from another program or file option from the drop-down menu. After clicking on Next, you will get the option of Import a file. In the Select field type, select Comma Separated Values. Then the File to import field will appear. Here you can click on Browse and navigate to the directory in which you have got your files saved. Select file. In the Options field, you have to select Do not import duplicate items. Then, click Next. You will get the option of choosing any available folder in Select destination folder. Click finish. Your process of lotus notes contacts to Outlook export is over. Then you can open Microsoft Outlook accounts, click on contacts to view the finished result. The most common problem of loss of data integrity and corruption of data has been handled effectively by this tool. So the process to export lotus notes address book to Outlook does not leave the data corrupted. So you can submit all kinds of data to this tool worry-free. Yet another reason to prefer this tool for lotus notes contacts to Outlook migration is fast speed. While the manual process is elaborative and time-consuming, the task gets finished in a jiffy with this tool. It achieves high speed by converting multiple NSF files at once into PST format. The effectiveness and safety rate remain unaltered with this trick. Those who use this for lotus notes contacts to Exchange migration have the option of converting files to EML and MSG as well. This facility gives the client, the convenience of accessing those mail items through other email clients as well. The process involved to export lotus notes address book to Outlook does not baffle the users of this tool. Thanks to the GUI of the tool which is quite simple. It has been made keeping in mind all variety of users- beginners as well as experts. No technical expertise is needed to use it unlike as in the manual method. During the lotus notes contacts to Exchange migration, one does not have to worry about the difference in mailbox and inbox items. This option allows users to migrate items from one folder to another in easy manner. This feature comes useful when migrating NSF files and Lotus Domino server into Office 365 and Live Exchange server. It allows easy exchange of email address. You would like to preview your data before you export Lotus notes address book to Outlook. So we have provided this option so that you can remain reassured about the contents. Hence, you can carry the process without doubts in faster manner. To serve to the need of the client to check this tool before investing, we provide a free demo version. Further, you can use this version to export Lotus Notes address book to Outlook for free. Invest into it only once you are familiar with its features. It can migrate up to 25 items per folder without restrictions. Don’t forget to check our newest arrival on Lotus Notes to Exchange Migration and Lotus Notes to Office 365 Migration. These and many other minute features will be available to serve you once you buy this tool. If you are already as user, let us know your experiences and suggestions. If you want to test the free trial right now, click here.